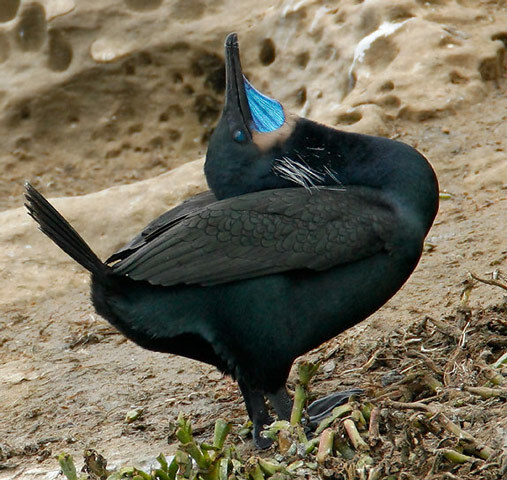 Brandt's Cormorant: Resident along Pacific coast from southeastern Alaska south to Baja California. Preferred habitats include rocky coastal shores. 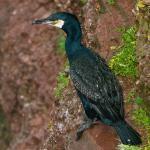 The name Cormorant is derived from the Latin words Corvus Marinus, meaning marine crow or raven. Their habit of seeking out high perches after a meal and their dark color, both reminiscent of the crow, may account for this name. The Brandt's Cormorant has a large range, estimated at 100,000 to 1,000,000 square kilometers. 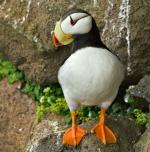 It is native to North America and lives in neritic and coastal or supratidal marine habitats. 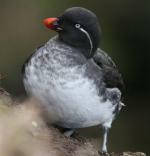 The population of the bird is estimated to be 230,000 individuals. Current population trends are not approaching the threshold criteria levels for population decline that would necessitate inclusion on the IUCN Red List. Because of the current population trends, at this time Brandt's Cormorant has an evaluation level of Least Concern.